After India won the first two ODI matches, Australia stormed back in the series and won the next two ODIs. In the third ODI, they posted over 300 runs and defended the target successfully. The fourth ODI between these two was held in Mohali. The Indian captain Virat Kohli won the toss and elected to bat on the flat Mohali wicket. Indian openers gave them a perfect start, which was missing in the opening three ODIs. The opening pair crossed 100 runs for the 15th time in the ODI cricket. When the score was 193, Rohit Sharma, who was batting exceedingly well got out for 95 and this is the fiftieth time he has been dismissed in the nineties. On the other end, Shikhar Dhawan continued his aggressive brand of cricket. He made his career-best 143 and continued with his form. 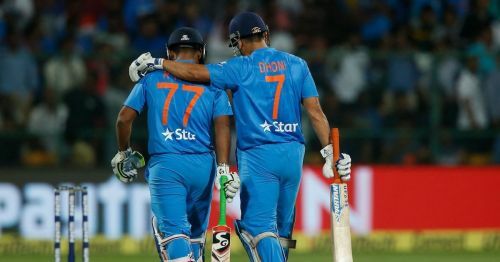 When India lost the opener, the team struggled a bit in the middle, but the cameo from Pant and Vijay Shankar ensured India to cross the 350 runs mark. The best moment of the match was when Jasprit Bumrah smashed Cummins's ball with a six on the last ball. Virat Kohli jumped out of the joy after seeing the six and India posted 358/9 in 50 overs. Australia lost both Finch and Marsh inside four overs, with a mountain target. The Australian captain got out to Bhuvneshwar Kumar for the fourth time in his last seven ODIs. Usman Khawaja and Peter Handscomb brought the visitors out of the disaster. Both of them shared 192 runs for the third wicket. Khawaja missed the century by nine runs. Peter Handscomb made his maiden ODI century. Australia kept losing the wickets in the middle. India had clear control over the game till that time. In the 44th over, when Turner was batting at 38*, Chahal fired the ball in the leg side. The Indian young wicketkeeper missed to collect the ball and missed the possible stumping. The Mohali crowd started chanting ''Dhoni Dhoni'' after seeing this. Pant was clearly looking under pressure. In the same over, he tried to flick the ball for a runout. The crowd again started chanting Dhoni's name. Yes, Dhoni is one of the best wicketkeepers in the world and has enough amount of experience. Filing his shoes overnight is not possible for any wicket keeper. It takes time for young wicketkeepers to groom and become one of the best behind the stumps. Until that time, we should not put so much pressure on Pant. This incident evoked a debate among experts and most of them felt it is harsh on the young man and we should let him have his own space of time. Adding insult to the injury, Ashton Turner started bashing Indian bowlers post that missed stumping, which made Pant even worse on that day. Turner scored 84 runs in 43 balls, including six massive sixes. Indian death over specialists Bhuvi and Bumrah also could not stop the onslaught. Australia registered their highest ever chase in the ODI cricket and thanks to the breathtaking innings from Ashton Turner who might have booked his ticket for the World Cup.